TOUCH OF CREATION: Love Banner!!! Today I'm sharing few new DCWV products with you all!! Absolutely fun stuff called INSTA PHOTO FUN. Its a collection of mini 4x4 albums, paper pad, photo sleeves, photo props and more. You can find them at Joann.com or their stores. I created a Banner for V-day with the letters and Heart from Wedding Photo Prop set. I also used the mustache from the Mustaches & more set. I embellished the banner with Mirrored Hearts. The sentiment is from Winnie & Walter stamps. I love how the banner turned out. Crafting for all Seasons - Have a Heart. QKR Stampede – Anything but a card. I used Insta Photo Fun paper pad and photo props for this card. 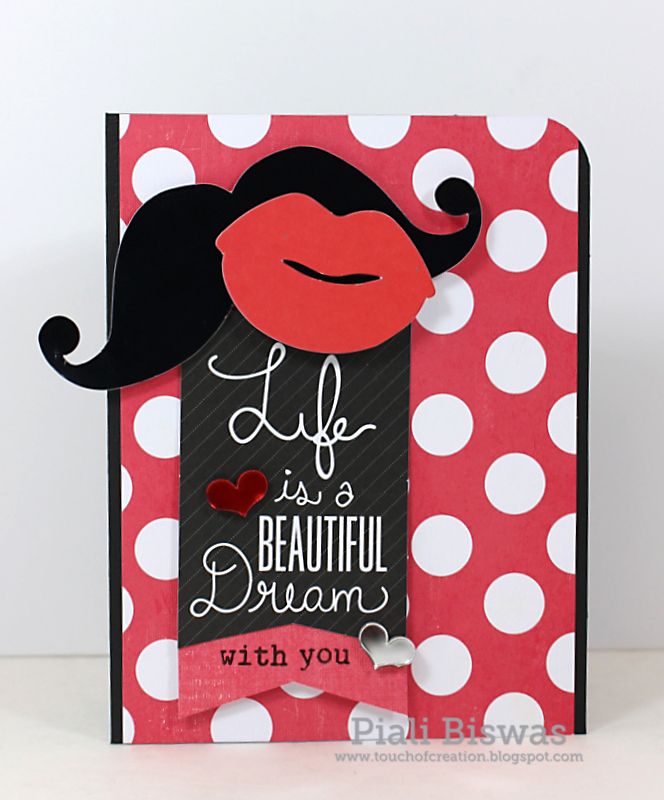 Red polka dotted background is from DCWV card box, I just trimmed it to size of the card front. Hope you liked these projects!! I'm working on a mini Insta album, will share it on my blog soon. Both your projects are just Fabulous Piali ..The colors the layers everything is so beautiful . Oh, these are awesome! I love them! What a fun banner and card! What fun projects! It's great to see how creative they are. Thanks so much for joining us this week at QKR Stampede for the weekly challenge! Lovely creations and a fun card. Thanks for sharing with us at ABC Challenges. Lovely project! Thanks so much for joining us this week at QKR Stampede for Anything But a Card.